Utagawa Kunihisa II (1832 - 1891) Illustration of the Grand Shinto Shrine of Izumo, 1862. Oban Triptych. Kunihisa was an important pupil and son-in-law of the great Utagawa Kunisada. This well known print shows one of the holiest Shinto shrines in Japan - the Shrine at Izumo. It is a kind of potted history, showing the temple precincts, some legends associated with the temple and the votive activities for which it was (and remains) famous. Seated inside the temple are the Sun Goddess (Amaterasu Okami), Okuninushi, the old ruler of Izumo province and a deity himself and Suzeri-Hime, the daughter of Susano-o (The God of storms and the sea). Around them are seated minor deities and assistants engaged in the preparation of fortune-telling scrolls, a practice that continues today. At the front of the print are the visiting pilgrims, travellers and ascetics and the functionaries of the temple. 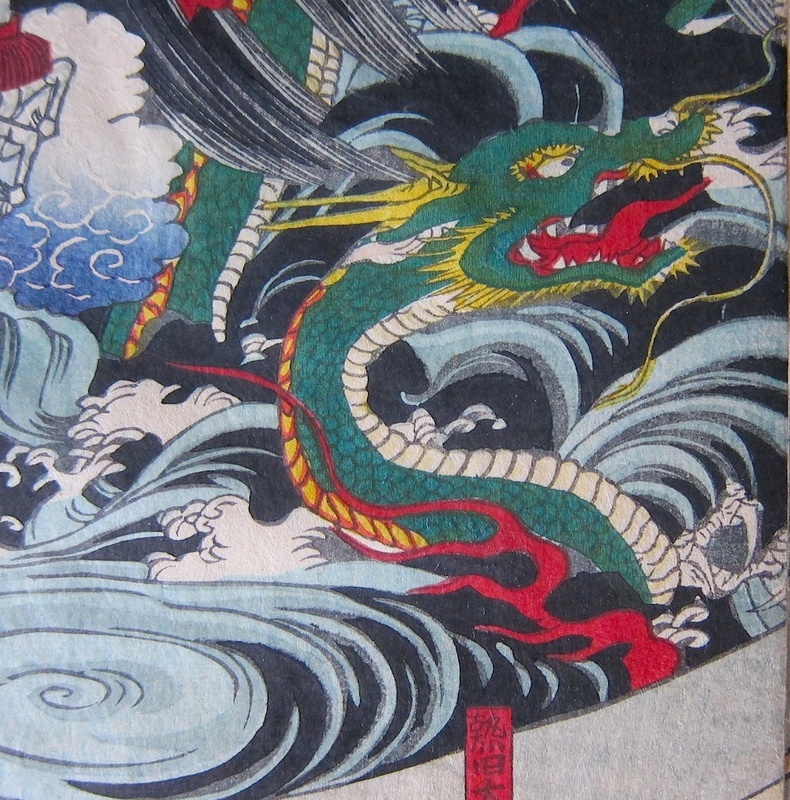 The print is alive with action and incidental detail; in the left panel, emerging from a whirlpool is an enormous dragon, the scene is littered with various heroes, tengu and legends associated with the province. A fine triptych by a relatively uncommon artist. Colour, impression and condition are all very good with gauffrage and added mica powder. Signed Kunihisa, published by Daikokuya Heikichi. Each sheet 36.8 x 24.5 cm.